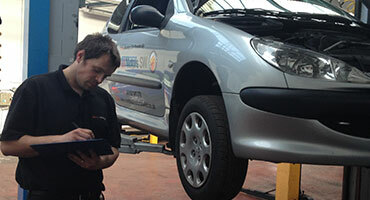 How likely is your vehicle to pass its MOT? Once your vehicle is three years old, it must undergo an MOT test on an annual basis by a Department for Transportation-approved garage. This is to determine whether your vehicle meets road safety and environmental standards. If your vehicle passes its MOT, it will be awarded a VT20 safety certificate. If it fails, the driver is permitted one journey to move the vehicle to a garage where the relevant repairs can be carried out. We have listed the key checks that a garage undertakes in order to determine whether or not your car is roadworthy. Some simple checks can be made before you take your vehicle to a garage increasing your chances of passing on first inspection. For example, testing all of your lights and windscreen wipers. You can book your MOT online, all you need to do is click on an available slot and book your car in with your details. MOT’s are currently available at JUST £20. Corresponding lights must be of the same colour, size and shape. The angle of the headlights for both full beam and dipped settings must be below horizontal to avoid dazzling other road users. The sound made by the horn must be one long constant note and should not be too quiet – other road users must be able to hear it. The battery must be safely and securely housed, with no signs of leaking. All wiring should be secured in a way that eliminates the risk of short-circuiting, or simply becoming loose. Any connections and sockets will be tested to ensure any lights on a trailer (parking, brake, indicator and rear fog) will respond correctly. Please note that this is very easy to check before delivering your vehicle for an MOT, a huge amount of test failures are due to faulty lights. The tester on site will make sure that all is in order with the steering, checking its general condition and durability by turning it in a number of directions and looking for damage or breakages to any of the steering elements. If your steering system has a locking mechanism, the tester will ensure that it only deploys when the engine is turned off. If a vehicle has power steering then the levels of power steering fluid in the reservoir will be checked. The vehicle’s suspension and shock absorbers will be inspected for wear and tear. The brakes, pedals and levers are thoroughly inspected, along with corresponding warning lights. A braking test will be initiated to test their responsiveness. The tyre must have the relevant rating for the vehicle, while the tread depth must meet minimum standards (1.6mm). There should be no cuts or lacerations on the tyres exceeding 25mm and the tyres will also be checked for other irregularities. Another easy check that you can carry out before arriving for your MOT is to inspect your tyre pressure. This can be done at most petrol stations and by doing so you could be avoiding a repeat visit to the garage. Seat belts will be checked for positioning, security and general state or repair. There is a general check of the car’s body, there should be no excessive rust or corrosion or sharp or protruding edges. A registration plate must be in place both at the front and back of the vehicle. They must be firmly in place and clearly distinguishable to someone 20 metres away from the vehicle. The characters on the plate must follow regulation. Your car must permanently display a VIN at all times, either on a VIN plate fixed to the vehicle, or inscribed on the body or chassis. You must have a speedometer and a check will be carried out to ensure it can be illuminated. The glass on the dial can be damaged, as long as the speedometer is legible. The exhaust system should not leak and there should be a catalytic converter in place if there was one originally fitted on the vehicle. The fuel system should be completely seal-able and should not leak. The vehicle will be checked for excessive fumes. A fail can result from excessive density and colouration of exhaust smoke. All mirrors must be firmly fixed in place and offer an acceptable field of view to the driver. The wipers must also provide a clear view through the front and rear windscreens. The area in front of the driver should not be damaged in a way that interferes with his or her view through the windscreen.